These companies achieved a Top 10 ranking in at least one of four key categories. Every year, we identify the connector companies that most stand out in this ever-changing industry. It’s no easy task to keep up with the next big innovation — especially when that phenomenon is occurring across multiple markets. Yet every year, hundreds of companies demonstrate the flexibility and creativity needed to accomplish this very feat. In our last article, we listed the top 10 companies in four areas: total sales, geographic region, products manufactured, and market served. 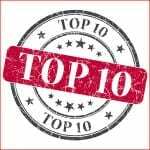 Below, we analyze the sum of these lists to arrive at our final, overall top 10 supplier rankings. The following table identifies the 47 connector companies that — through our thorough analysis of total sales by region, products, and markets — have achieved an overall top 10 ranking. The table also identifies the number of top 10 mentions that each company achieved in each area of investigation, as well as their overall ranking in the global interconnect industry. We identified 47 companies with a top 10 ranking. We believe this information is very useful to the user community in identifying, researching, and selecting the companies with whom to partner. Other levels of information are also important. For example, who are the leading companies in Germany, the United Kingdom, France, Malaysia, Taiwan, etc.? Who are the leading companies in Germany that supply military circular connectors or have heavy-duty power types? The quest for the right supplier for your company is not easy. However, identifying the companies under various definitions makes a difficult task easier. Bishop & Associates’ research report, The World’s Top 100 Electronic Connector Manufacturers furnishes detailed statistics that benchmark the leading connector manufacturers by 2015/2016 total sales, sales by end-use equipment market, sales by product category, and many other key industry measurements. Click here for more information.